NOTE: The text of Philip Marmorstein versus Michael Greiner originally appeared in machine-readable form as part of the MatchQiz series. Championship of Great Britain, Malaga, Spain, May 1991. Final match, 25 points. COVER: Germany's Philip Marmorstein won the World Championship in Monte Carlo in 1988. 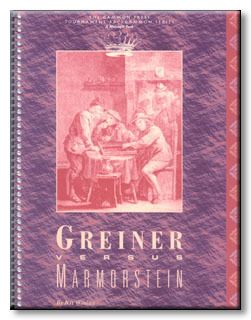 Greiner is one of Europe's top competitors. In this bookone of a series of annotated match books available exclusively from The Gammon Pressworld-class strategist Kit Woolsey takes you behind the scenes to show you how these champions plot their moves and how you can use their insights to improve your play.